Mokolo Dam is without a doubt the most spectacular and great dam on the current EBASS circuit and each year competitors really look forward to visiting this stunning venue. The fishing however, was a bit disappointing and not easy, with bag weights relatively small compared to previous years. The top 5 teams presented bags weighing in between 4,20kgs to 5,00kgs at the weigh station. The results were once again unbelievably tight with a mere 1 gram difference between the winners and the runners-up. 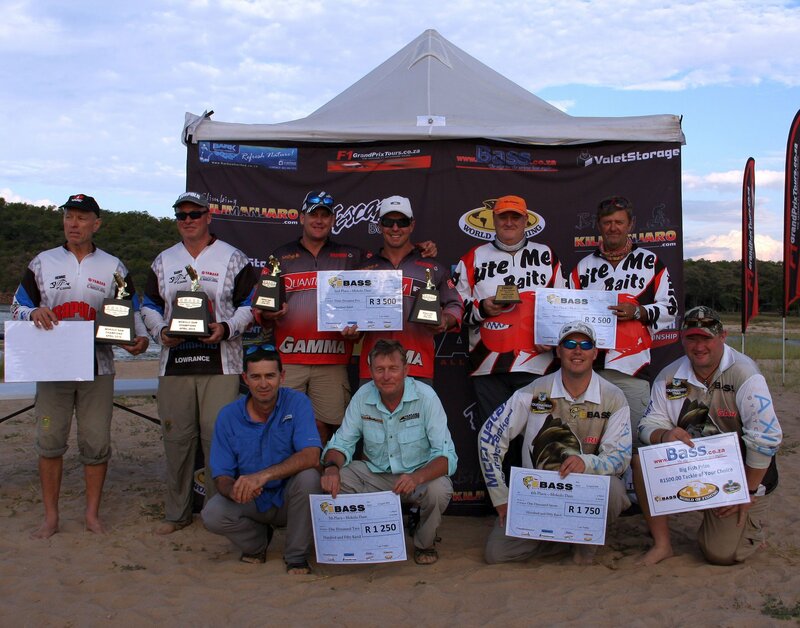 The total prize money on offer for the event was a fantastic R 17 500, resulting in serious and extremely competitive fishing on the water! Mokolo dam produced a lot of 400-500 gram fishes and a 800 gram fish was considered to be a quality fish and a big boost to any bag. Fishing patterns were much diversified and no specific pattern dominated the day – in fact fish was caught in anything from 1’ to 35’ of water. Jigs were successful on mainly rocky banks and deeper cliffs areas, but drop shot plastics, mojo rigged stretched 40’s as well as junior flukes also produced some good bags. There was also a relatively short window during the day, during which top water baits produced some of the better sized fish. The Ebass committee would once again like to extend a big thank you to the following sponsors – without their fantastic support this great tournament trail would not be possible. F1 Grand Prix Tours, Valet Storage, BASS.co.za / World of Fishing, Biking Kilimanjaro, Escape Boating, Climbing Kilimanjaro, Zandre Taute Guiding and Hosting Services and Bark Unlimited. High rainfall and high flow rates has made the Vaal river rather difficult to fish at the moment, so the committee has decided to swop the dates for the next two venues – Vaal river and Bronkhorstspruit dam. The next EBASS event will therefore take place at Bronkhorstspruit Dam on 05 May 2018 and on the Vaal River on 02 Jun 2018. No Replies to "THE EBASS TRIAL – Mokolo Dam 2018"